Shred the spring onions and put inside the chicken with the ginger, quartered lemons, star anise, Szechuan peppercorns, regular peppercorns, cinnamon, and the stalks and roots of the coriander. Sew the cavity shut then put it breast-side down in a pan in which it just fits. Cover with cold water or stock, add the rice vinegar and bring to the boil. Skim, reduce the heat and simmer gently for 30 minutes. Turn the bird breast-side up and cook for another 20 minutes. Put on a lid, remove from the heat and leave to cool in the liquid. When it reaches room temperature, remove and drain. Remove the skin and discard. Cut and pull the meat from the bones, removing the breasts whole and cutting them across on the diagonal into the thinnest slices you can manage. Arrange these slices overlapping on a serving plate, scattering the shredded leg and thigh meat over. Return the carcass, bones and aromatics to the pan and simmer for 2 hours. Strain through a sieve, then dribble 4 tablespoons of this strained broth over the chicken. Refrigerate overnight. Remove the skin from the oranges and cut into segments. 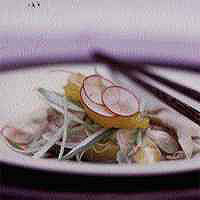 Cut the radishes and shallots into paper-thin slices. Toss in a bowl with the rice vinegar and 1/4 teaspoon salt. Scatter whole coriander leaves over the top. To serve, bring the chicken to room temperature. Trim the remaining 4 spring onions into green and white parts, cutting the white onion across in thin rings and shredding the green parts lengthwise before distributing both evenly over the chicken. Dress with splashes of soy sauce and serve with the salad.